I don’t do a lot of breakfast foods on here and that’s primarily because breakfast for me usually consists of scrambled eggs, a whey shake and a banana. 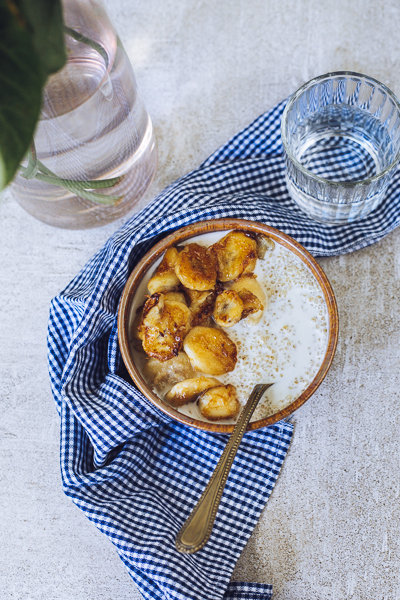 I have however started incorporating more millets and whole grains into my diet, and the easiest way to do this I’ve found, is to add them in a porridge. 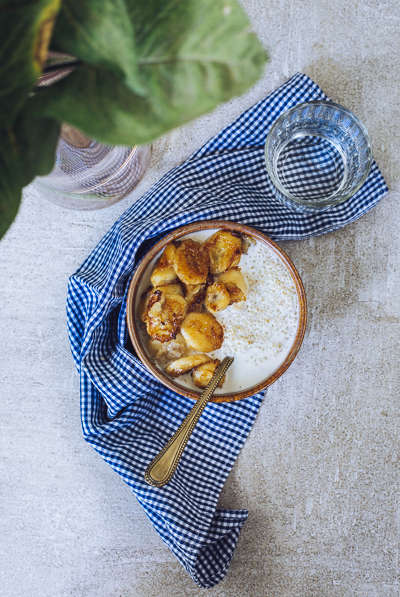 Lots of ways to tackle said porridge pursuits: cook large batches—I use quinoa, amaranth, foxtail millet and barnyard millet—and store them in the fridge for the week. If you don’t particularly like the store-bought coconut milk variants, again, make a batch and refrigerate for the week. My husband eats the grains for lunch with his salad and I bung them in my porridge. Meal planning 101. Some of these grains and millets may look alike, but they all cook differently. Quinoa, when cooked right (to al dente), tends to maintain its structure a lot more than say, oats or barnyard millet which need less time to cook, and will look slightly more homogeneous upon cooking. Not hard to figure out, but definitely follow packet instructions carefully the first few times and keep an eye on it towards the end of cooking. It just makes sense to keep some of this information on hand to prevent soaking burnt pots overnight with large amounts of dish soap to work some elbow grease the next morning, you know? 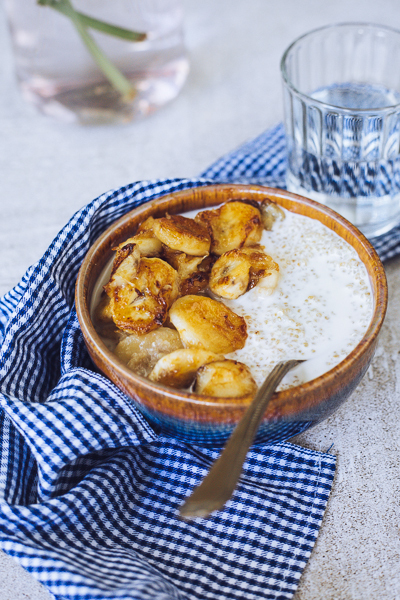 I’ve used ground cinnamon to flavour the porridge in this recipe, because I am a sucker for any and all things cinnamon. Cardamom, star anise, orange zest, vanilla, all work really well here. Use any fruit of your choice, milk of your choice, add granola on top for crunch, it’s a blank slate, really. Cook quinoa according to packet instructions until all the water has been absorbed. Stir in coconut milk, salt and ground cinnamon. Keeping the pot on a low heat and making sure it doesn’t boil over, cook for a further 2-3 minutes just to reheat the quinoa with the coconut milk. Set aside. Slice the bananas into thick rounds. Add the sugar (or your sweetener of choice) to a pan and heat through just until it starts to bubble around the edges, about 40 seconds. Add the banana slices to the sugar and cook for 3-4 minutes, flipping them over a few times to ensure it’s coated and caramelized on all sides. You don’t want the bananas to get mushy, so as soon as it starts to brown, it’s done. To serve, divide the porridge between bowls. 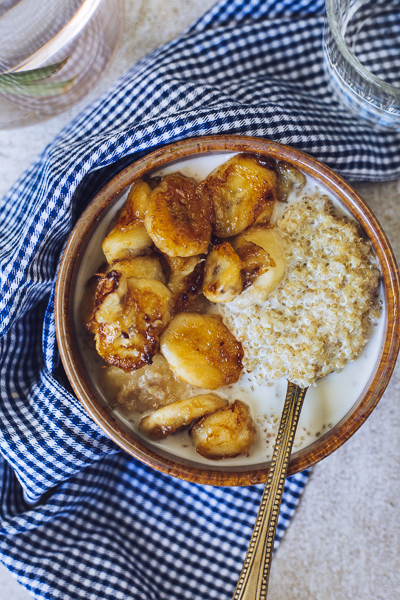 Top with caramelized bananas. Serve hot or at room temperature.